"Drones are a tool, not a policy. The policy is assassination." The Intercept has published The Drone Papers, a lengthy look inside President Obama and the U.S. military’s use of drones. The source said he decided to provide these documents to The Intercept because he believes the public has a right to understand the process by which people are placed on kill lists and ultimately assassinated on orders from the highest echelons of the U.S. government. ‘This outrageous explosion of watchlisting—of monitoring people and racking and stacking them on lists, assigning them numbers, assigning them ‘baseball cards,’ assigning them death sentences without notice, on a worldwide battlefield—it was, from the very first instance, wrong,’ the source said. A previous version of this post stated that The Huffington Post and The Intercept published The Drone Papers. 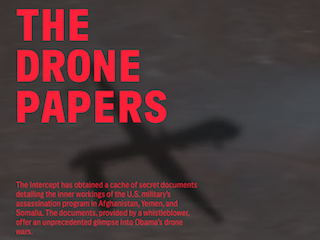 The Drone Papers was published by The Intercept; HuffPost published an excerpt.